These are for smaller homes with very limited installation space and low power requirements, such as the essentials; refrigerator, sump pump, kitchen Circuit such as your microwave, a room or two in which to give you some lighting in your time of need. Whenever possible we try to recommend the largest generator KW output to give you the most flexibility and value for your money. 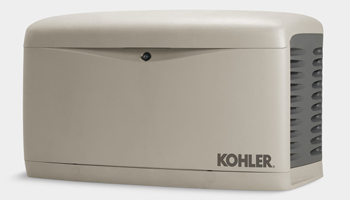 These generators have a small dimensional footprint of 28"X30"x32" and should be installed at least 5' away from any functional window or air vents and allow for adequate air flow and accessibility to service the unit. For the mid to larger sized home where space concerns are not as restrictive there are several sizes to choose from based on your needs. These typically power the whole house. These generators have a larger footprint due to the size of the unit and comes in at 48" X 27" X 29". They should also be installed at least 5' away from any functional window or air vent and allow for adequate air flow and accessibility to service the unit. Every generator requires a 12 Volt battery for operation, these typically cost anywhere from 75 to 100 dollars based on the size of the unit you select and should be factored in for your budget. Some company's will lure you in with a low generator price, a good example would be not to package your generator with a transfer switch, a hidden cost that you will discover later. 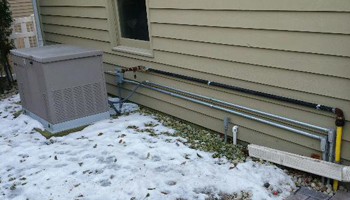 This is why we only quote generators with the transfer switch. Every home will need a transfer switch. Additionally , since we are in a cold weather climate and the last few years we have had some brutal sub zero temperatures we highly recommend one of the cold weather kits. We will offer this as an option to you when we quote your generator installation. Last but not least, is the installation of your unit; while the concept is the same for all installations, the conditions are not, and we cannot give you an exact number without doing a walk through of your home and property. If your generator is located close to the electrical panel and the gas meter installations can be as low $2500, and as high as $4000. We can setup an appointment to review your needs and give you a firm quote so there's no hidden surprises. Quality, pride and workmanship is very important to us, unlike some other contractors who use those prefabricated pads or pea gravel bases for your generator to rest on we do NOT. We custom pour a concrete slab so that your generator has a good base. While everyone is looking for a great price, why sacrifice your investment for just a little bit more. Ongoing maintenance for your smart investment. The battery should typically be replaced annually along with an oil change and general inspection of your unit. We offer a maintenance plan that is done annually in early Spring. We also install other generators, if you have purchased one at one of the home improvement stores or even online for that matter we can still handle the installation for you. Feel free to use our contact page to setup an estimate, or if you simply have more questions that we could answer for you. *The prices reflected are for the generator and transfer switch, this does not include sales tax or the installation of the unit. Please note we are not a generator distributor and do not sell just the units. The price listed is just to give you a cost comparison when selecting a unit.